THE READERS RAG: HARRY POTTER AND THE CURSED CHILD: NOT QUITE THE SAME, BUT STILL WORTH THE READ! 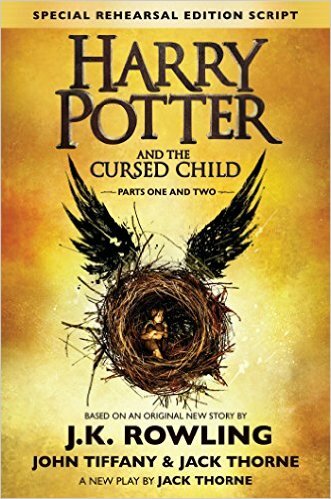 HARRY POTTER AND THE CURSED CHILD: NOT QUITE THE SAME, BUT STILL WORTH THE READ! Today I was driving my daughter home from a recent visit with a friend. Just to be sure I understood her situation vis a vis Harry Potter, I asked, "So you've never actually read Harry Potter, or any of the seven books." "No." she answered simply and frugally. There was some silence while I waited for her to elaborate, but as the seconds ticked by I realized I wasn't going to get anything from that. I jumped in with my next question. "What happened? I asked, "How could you have missed it?" My daughter is 17, so I hardly think she has an excuse. "I didn't really miss it," she responded, "because you read all seven books to me." Goodness me, how could I have forgotten! Well, actually, I have an awful memory. My point is that Harry Potter and J.K. Rowling are practically gods in my home. In fact, my older daughter celebrated her 18th birthday by driving to New York City with a friend and getting a Harry Potter tattoo under her right arm. I guess that was her idea of rebellion. I'm going somewhere with this, so don't get impatient! This is why it was practically a sacred duty for me to purchase, read and review the new Harry Potter book, "Harry Potter and the Cursed Child" by J.K. Rowling and crew. A crew is what you get, I guess, when you are feeling tired and have the ability and willingness to formulate a plot, but don't have the energy to finalize the book, or in this case the play, by actually writing it. Here the crew consisted of John Tiffany and Jack Thorne. Of course, right at the bottom it states, "A new play by Jack Thorne" so if it is by Jack Thorne, I'm not sure why anyone else is nearby hinted to be the author, but maybe no one was likely to read anything by some guy called Jack Thorne. AND REMEMBER, THIS IS A PLAY, NOT A NOVEL. Apparently, some people purchased the book and were not aware of that, and then got angry feeling gypped. Look at the top, people! It says, "Special Rehearsal Edition Script." Anyway, as you know, I like to talk about the book cover design of any book, and I will not disappoint here. My first impression of the "Cursed Child's" book cover was that it did stick by the Harry Potter's standard book look. At least the last three of the Harry Potter books have used solid colors-blue, green, and then orange--in the overall look. 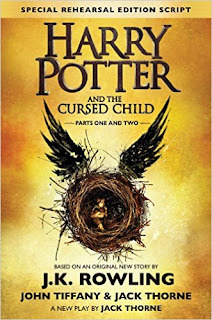 The "Cursed Child" uses the color yellow. Please note, up to this point, Mary Grandpre designed all seven of the Harry Potter book covers. However, in this last book (the eighth) artwork and logo are attributed to Harry Potter Theatrical Productions Limited. All I can say is that, to the extent that the artwork was influenced by Mary Grandpre, that should be acknowledged. I did spend a considerable amount of time online looking for an explanation of the symbol of the winged nestlike snitch with the boy in the interior. What does it mean? Does anyone know? Thus far, I haven't been able to locate any definitive discussion on this issue, but I'm sure lots of people are still trying to figure it out. I think your perspective would differ depending on whether you'd read the play or not, and since the play was so recently published, we still don't have any informed assessment of the cover just yet. We may eventually have one, and I will certainly keep my eye out. However, I will say as my first "best guess" that the current play, "Harry Potter and the cursed Child" is about the Harry and Ginny, Draco, Ron and Hermione's children leaving home--"the nest"--to enter Hogwarts and make their way in the world. How they do so is the central drama of the book. So that could explain the symbolism of the nest. Parents, and many of us ancient fans of the Harry Potter series who are now parents, will particularly relate to this play in many ways. When do you intervene? When do you hold back? Who could possibly know how to do it all right as parent to a child, but don't we all wish we could do so? My experience of reading this play, rather than a novel, was somewhat off putting at first. I will admit I am used to having J.K. Rowling spoon feed me with her narratives. In this case, I did have to fill in the scenes and the protagonists expressions and thoughts using my own imagination. But once I got over the extra challenge required, I pretty much found my stride and enjoyed the reading. I was delighted to be in the magical world of Harry Potter once again and enjoyed myself immensely. The reading was suspenseful and there were all sorts of twists and turns in the plot, some of which surprised me. The old going back in time and unexpectedly changing the future, well, that's been done before and is a bit cliched. But I don't want to get into too many spoilers here. Suffice it to say that the gaps in understanding between parents and children provide several handy cracks for Voldemort and his allies to slip through. Be prepared to be very, very afraid! As per usual, I looked for (because these Harry Potter books are ultimately quest narratives from which you return bearing many gifts!) and found many words of wisdom in the narrative and wrote a few of them down. Here are a few I really appreciated, "There is never a perfect answer to this messy emotional world. Perfection is beyond the reach of human kind." What a relief! To be honest, this insight is more difficult to arrive at than you might imagine. Some people will spend their entire lives trying to be perfect and insisting that those around them be perfect and torturing them in the process, so don't underestimate Harry Potter's simple wisdom. It is actually more valuable and more hard won than you imagine. Here is another, "We can't help our children to avoid the pain of life, but we can teach them to face it." I may have played around with the wording of that one. But this admonition to parents is so welcome considering how difficult it is to see your kids move along in life without you, knowing that you just have to count on the good upbringing you gave them for them to do ok and be happy, which is all parents want for their children anyway. I don't want to keep on with this. There are many of these bon mots, many exciting and scary scenes, many touching moments, many thrills and chills that we the Harry Potter audience have learned to know and love over the years. 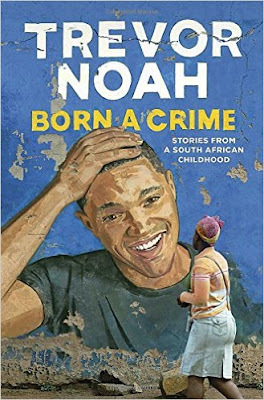 So folks, go read the book and enjoy. It's not the entirety of what J.K. Rowling is capable of giving us, but it is good enough, and I think good enough is acceptable. Don't you?